Of late I've been reading through some history books written by G. A. Henty, and while his target audience was teenage boys, I find them informative and entertaining. 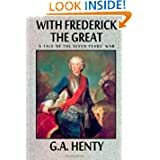 The lastest titles I've read are from the 17th and 18th century, a time of great bloodshed as Europe struggled for control of trade, land and power. By looking at history mostly through the eyes of a young man on the scene, I get a better feel for the events, culture, geography, and prominant historical figures. The old refrain that history repeats itself is proven true, and I also see how some struggles have roots many hundreds of years back. My readings have given me a new perspective on current events. Some things that cause great outrage today, would have been hailed as being too good to be true in that time. For example, headlines scream when a just a few of our soldiers are killed, but in the battles of previous centuries, a loss of a thousand may have been considered minor. Often armies of thirty thousand would meet each other to fight for a third party's cause. A quarter of each side might be lost by death, wounds, or as prisoners. The more savage cultures would kill their prisoners, pillage and burn down villages, destroy farmland in the conquered area, and mistreat the women. Another impression gleaned from these novels is of the impact one man can make on the entire course of history. As a child I had this vague idea that the world ran on some invisible agenda that would be followed no matter who was in power. Sadly, I think many American adults still operate under this dilusion. However, history proves that the integrity of one man or his barbarianism alters life for millions of others if he holds a position of influence. Neither should we forget that many a man has been made by the ideals his mother impressed on him in his earliest years, and later in life, he may be influenced by the woman who has his ear, whether she use it for good or evil. Obviously, training both boys and girls to be virtuous is vital, and we would do well to support parents in their efforts to accomplish this daunting task. Integrity tops the list of some common traits I see displayed in the best leaders in these books. A man or woman of integrity can be relied upon and is not swayed by greed of power nor money. King Louis XIV, who reigned during the War of Spanish Succession, was sadly influenced by wicked men, but his redeeming quality was that he was a just king, and never knowingly punished an innocent man. For lack of being a good judge of character, Bonnie Prince Charlie lost his only chance to return the House of Stuart to the English throne. Good leaders are humble, and quickly promote those under them who display deserving qualities. They also honor the bravery and courage of their enemies, and do not strive for renown. Many a war has been lost or prolonged with terrible loss of life when generals squabble over control, fight more for their own reputation that the honor of their king, and deliberately undermine the work of comrades. A whole thesis paper could be written on the topic, but I'll leave it at that. I'd love to have your comments!